Conservation of Energy Co. Ltd.
Last summer, Dariusz Wilamiowski set a new Polish diving record with a depth of 264 metres in Lake Garda (Italy). To help him get his bearings, he was equipped with two lamps specially designed for this kind of exercise. 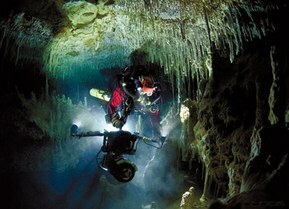 The search for a link between two underwater cave systems each extending over several kilometres of the Yucatan peninsula in Mexico also involved Lapp cables and GRALmarine lighting. First of all, a photographic record of the caves was produced. This required extremely powerful illumination. Here, the divers used a battery-driven 200-W-HMI discharge lamp and LED lamps. In order to better protect the cables in the diving lamps, SKINTOP® BS screwed cable glands are used. The ÖLFLEX® 440 P or ÖLFLEX® 550 P is generally installed for the entire circuit and connected to the battery. For the diving record in Lake Garda, the lamps were connected to the battery with an ÖLFLEX® CLASSIC 400 P cable. This cable features particularly high mechanical and chemical resistance. Thanks to the special polyurethane sheath, a longer service life is guaranteed even in rough operating conditions. In Mexico, the lamps were connected to the battery with an ÖLFLEX® 550 P cable in an orange polyurethane insulation. This all-weather connection cable is particularly resistant to wear and boasts a high mechanical and chemical resistance. The lamps needed to be able to operate at a depth of 100 metres and both the rubber and polyurethane insulated cables proved to be ideally suited in terms of their mobility and mechanical strength under water. When manufacturing underwater lamps for extreme depths (more than 100 metres), it is vital for the connection between the lamp’s metal housing and the power supply cable to be absolutely impermeable. This is achieved using special apertures with a rubber sealing material and polyurethane filler, enabling the diving lamps to function without a problem, even at a depth of 1,000 metres. For connection to the batteries within the hermetically sealed housing, screw connections and cables are required that are suitable for use in rough operating conditions, that can be flexibly used at low temperatures, are resistant to wear and offer particularly good protection against water and contamination. With underwater vehicles, the cables are also exposed to a number of harmful substances or need to be able to withstand the sharp edges of underwater equipment or wrecks. SKINTOP® BS screwed cable glands, ÖLFLEX® 440 P, ÖLFLEX® 550 P, ÖLFLEX® CLASSIC 110 connection and control cables. Polish company GRALmarine specialises in producing diving lamps, developing individual lighting solutions for various requirements. Another key sector of GRALmarine is monitoring systems for diving and for remote-controlled measurements.